My latest video grew out of my recent crappy experience with decals on my 1/32 Mustang (does it feel like this build has been going on forever?). The setting solution seemed to react badly with the Eagle Decals, and it dried leaving ugly big wrinkles. I had to do something with them, and this video shows the result. Pictured: a crappy, crappy problem to try to overcome. I'm not 100% satisfied with where I've ended up. 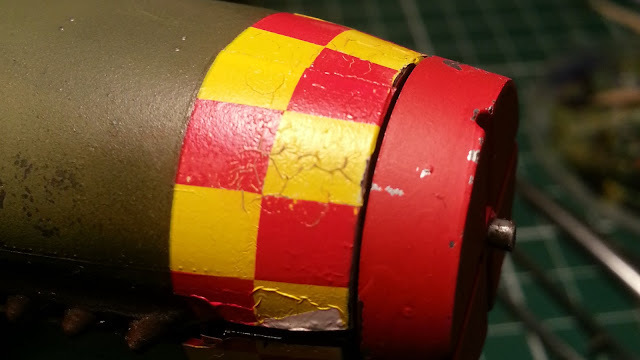 The nose chequers look a million times better - a combination of weathering, chipping, and building up layers of varnish have solved the problem there. But the "stars and bars" national insignia is another matter entirely. I tried the same solution there, weathering, chipping and layers of varnish, but it's just not s satisfactory. Rivet and panel line detail has been lost, and it feels a little heavy-handed. It's still a big improvement, but it's not as good a result as the nose chequers. Anyway, have a look at the video and make your own mind up. I'm very open to feedback on this method, let me know how you would have solved this problem differently. 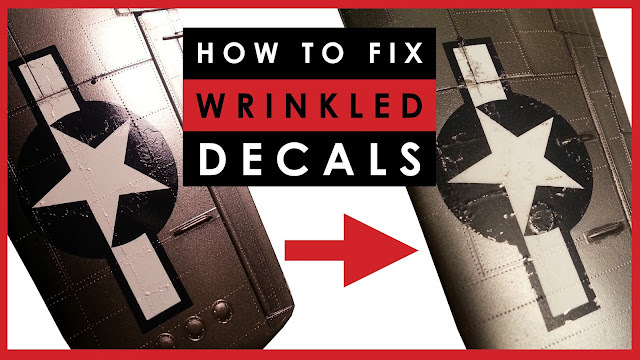 How to fix wrinkled or bubbled decals on scale models.